Ever since version 5, the AstrolDeluxe ReportWriter software has been able to calculate and display both modulus and harmonic charts, where the new planet positions are wave-multiples of their first-harmonic positions, and from the Chart Information screen's Display menu enable the user to display for such charts the graphic chartwheel, aspects list, angles list, planet strengths, midpoints, midpoint/planet aspects, sensitive points, sensitive point/planet aspects, planets/houses aspects, and text table of planet and house positions. Now, version 8.3.1 of AstrolDeluxe expands the toolset for doing harmonic chart research and calculations. You now have the ability to find saved charts with aspects in different harmonics other than the first or radical chart harmonic. This feature is now at Options, Research Charts, Search Two, By Aspect. The new feature says "Search in a Chart Harmonic of" followed by a listbox where the first and default setting is 1 = Normal, but the user can select or enter other harmonic numbers. The inspiration for this feature was Chapter 11, 'Dodekatemoria: An Ancient Technique Reexamined', in Robert Hand's 1982 book, Essays on Astrology. Robert Hand's 1982 essay sees one type of the ancient dodekatemoria positions of the planets as being the same as the modern 13th harmonic. In Mr. Hand's 13th harmonic chart, Mercury conjoins Uranus, which could explain his attraction to astrology and computers, while Venus squares Neptune and the Sun trines Saturn, perhaps giving the combination of insight and scholarship for which he is known. 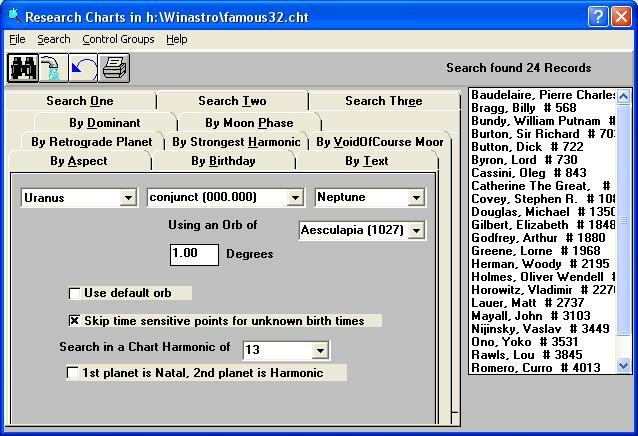 The new search feature allows the program user to set the Harmonic to any number, including 13, and search the 5113 Famous Charts for Mercury conjunct Uranus, which yields 62 results, and then search for Sun trine Saturn which narrows it down to three men - Robert Hand, actor Ian McKellen (Gandalf the Wizard), and jazz composer Thelonius Monk. All three project the image of bearded wise man. We would not know that they have anything in common if we did not look at the 13th harmonic aspects. Every chart must be looked at as a whole, but it can be instructive to compare people who have major aspects in common. In the screen shown above, you can also put a check in the box '1st planet is Natal, 2nd planet is Harmonic'. This lets you research and have the program find charts with specific contacts between harmonic planets and natal planets. Mr. Hand's essay discusses how Eleanor Roosevelt had natal Saturn conjunct 13th harmonic Pluto. The new tool enables you to find other charts with this natal to harmonic contact. On the Search One tab, the By House search adds 'Using natal houses, search in chart harmonic of ' with a listbox to select the desired harmonic for the specified planet. You may, for example, want to find all charts that have a 13th harmonic Uranus in the natal 2nd house - after selecting Uranus in the 2nd House, just change the harmonic from the default value of 1 = Normal to 13 and click the search button with the binoculars. When using a 3.00 degree House Advance Orb, the Famous Charts collection will show 237 records, including Bill Gates. If you double-click on Bill Gates it does not show Uranus in the natal 2nd house, but if you select Display, Harmonic/Modulus Charts and select 13 and Harmonic and Okay, it will display the chart in the 13th Harmonic Zodiac and if you then click File and Compare Harmonic Chart to Natal Chart, then you will see the 13th Harmonic Uranus in the natal 2nd house where it conjoins the close natal Jupiter-Pluto conjunction and squares the harmonic Midheaven. First of all, previous program versions in the Aspects List only showed conjunction aspects, regardless of whether it was a Modulus chart or a Harmonic chart. The new version shows all types of aspects between the planets of a Harmonic-type chart, and it uses the wide orbs allowed for natal charts. After you click on Aspects List for a Harmonic-type chart, you can click Sort by Orbs at the bottom, which will let you see which are the harmonic chart's most exact aspects. The Aspects List still shows just the conjunction aspects between the planets of a Modulus-type chart and it uses the narrow conjunction aspect orbs that are defined at Customization, Aspect Orbs for midpoints. The reason for treating Modulus-type charts and Harmonic-type charts differently is because modulus charts cut the 360-degree wheel down to just the initial segment defined by the modulus, such as the 90-degree dial (that results from a modulus of 4) only extending from 0 Aries to 30 Gemini. Harmonic charts, on the other hand, keep the 360-degree wheel because their positions result from multiplying the radical positions by the harmonic number - if the resulting positions exceed 360 degrees then any excess multiples of 360 are discarded. After you display a Harmonic chart (but not a Modulus chart), you will now have a choice on the File menu - Compare Harmonic Chart to Natal Chart. This is consistent with what Robert Hand does in Chapter 11 of Essays on Astrology where he inserts the 13th harmonic planets around natal charts for himself, Richard Nixon, and Eleanor Roosevelt and notes the aspects formed to the natal planets. For example, Eleanor Roosevelt's natal Saturn in the Seventh House conjoins her 13th harmonic Pluto. My wife's natal Jupiter in the Seventh House conjoins her 13th harmonic Uranus. Apparently, Seventh House interharmonic aspects can describe the spouse. After you have the biwheel of harmonic to natal, you can select Display, Synastry to see and sort the interaspects. Or, you can double-click once on a harmonic planet to see its harmonic chart aspects and double-click a second time to see its aspects to the natal planets. Also, the File menu choice will say Compare to Third Chart, which would let you click on the Here and Now button and Calculate in order to see the transits to both the inner natal chart and the middle harmonic chart from an outer third wheel. In his dodekatemoria essay, Robert Hand may concentrate on the 13th Harmonic, but it is a good idea to examine all the major harmonics. On page 114 of his 1976 book Harmonics in Astrology, John Addey says, "there lies concealed within the natal map an endless series of sub-charts, each with its own range of symbolic content and application." You can generate, examine, and compare charts based on other Harmonic numbers besides the 13th. On page 265 of his 1983 book Harmonic Charts, David Hamblin says that he regularly looks at what he calls the H4, H5, H7,and H9. Mr. Hamblin then says that his priority for looking at additional harmonics would be H11, H3, H13, H16, H12 and H25. Be aware that it is not valid to compare the planets of one harmonic to the planets of a different harmonic, so there is no facility to separately save the calculated harmonic charts, although you can print or save their images. The harmonic charts in which many planets are closely linked should be the active charts with which the native most resonates, as opposed to the harmonics that show little pattern. With version 8.3, AstrolDeluxe gives you the tools that you need to discover which are the effective harmonic charts. During her D7 period with Bruce Willis, Demi was channeling more the Seventh Harmonic sub-chart in which she bore and raised her three daughters. This sub-chart has Venus and Jupiter conjunct the 7th house cusp of legal partnership - she has the ability to connect with good partners. But this sub-chart has challenging aspects also, such as Moon conjunct Saturn in the 12th house opposing natal Uranus and Pluto and the 7th harmonic Sun. Elements of her childhood were difficult. Favorably, 7th harmonic Mars in the physical 8th house trines the Moon and Saturn and conjoins natal Neptune, the planet of the movie industry - she can project that active physical energy and is comfortable having her body photographed. During her D5 period with Ashton Kutcher, Demi was channeling more the Fifth Harmonic sub-chart during which she studied Kabbalah, socialized with friends, and promoted a charity against child sexual slavery. This sub-chart has Mars in the 11th house of friends trine Venus in the 3rd house and square to the 8th house Jupiter that aspects almost every planet in the natal chart, including the 8th house Sun and Neptune. A tight conjunction of Saturn and Pluto in the 4th house of the home indicates difficult home conditions, seriousness, and a capacity for self-renewal. The transiting aspects to these two different harmonic sub-charts at the times when Demi started dating the two men confirm that a person can switch from channeling one harmonic at one time to channeling another harmonic at another time. I find the Ninth Harmonic to be strong in the chart for athlete, businessman, sports commentator, and philanthropist Earvin "Magic" Johnson. In Harmonic Charts, Hamblin says that the H9 chart "shows the person's capacity to spread joy and happiness to those around him."  (p. 81). "In the deepest sense, the ninth harmonic is to do with knowledge and understanding and truth." (p. 83). Hindu astrologers always calculate the D9 or Navamsa chart (navamsha varga) right after they calculate the radical chart - the Navamsa chart, particularly its Venus, is said to describe the marriage partner. The aspects within the Ninth Harmonic chart are the same as in sidereal zodiac astrologer Cyril Fagan's Novien chart (on the AstrolDeluxe Options menu), although the chart placements are different. If you look at Magic's chart below, you can see that in the inner natal chart (unknown birthtime) there is a Fixed T-Square involving the Sun and Chiron with Jupiter as the T-Square focus planet (click here for an interpretation of Magic Johnson's two tight aspect patterns ). In the Ninth Harmonic middle chart, his tight natal Venus-Mars conjunction completes the Fixed Cross by opposing natal Jupiter. If you look at the most important date in his life, when he made his HIV-positive announcement, and compare the transiting planets to the Ninth Harmonic chart, a stellium of transiting Sun, Mars, and Pluto in Scorpio opposed the Ninth Harmonic Chiron, the planet of health issues, and transiting Saturn at 1 deg. Aquarius exactly conjoined the Ninth Harmonic Pluto. But the astrologer who took time to look at all the favorable transiting aspects from Jupiter, Saturn, and Uranus to the composite chart with his wife Cookie could have predicted a favorable outcome. Now let's look at the Ninth Harmonic chart for singer, dancer, and child actress Judy Garland. The natal chart has a close opposition between the Sun and Mars (ambitious energy), which is preserved in the Ninth Harmonic, but now Pluto conjoins Mars and opposes the Sun, and unlike in the natal chart, the Moon, Venus, and Jupiter are now all conjunct within 1d 30m and they form the focus of a powerful T-Square pattern (from the Sun opposing Mars and Pluto). Harder to see is that Ninth Harmonic Neptune, the planet of the film industry, exactly aspects her natal Mars and Sun in 135d and 45d aspects. When filming started on The Wizard of Oz in September, 1938, transiting Neptune had reached 20d Virgo, conjoining her Ninth Harmonic Mars and aspecting all six planets of her Ninth Harmonic T-Square. Judy was ready to channel Neptune's magic in "Over the Rainbow" and become a superstar. Garland later wrote that "'Over the Rainbow' has become part of my life. It's so symbolic of everybody's dreams and wishes that I'm sure that's why some people get tears in their eyes when they hear it. I've sung it thousands of times and it's still the song that's closest to my heart." We need the Ninth Harmonic Chart in order to see Judy's close connection to idealistic Neptune. It is my job as an author of Western astrology software to provide tools that empower my professional and hobbyist customers. The software should give everyone the ability to easily test the different techniques. This page shows you how to get started with harmonic charts. Although Western astrologers try to practice a more self-critical, synthesis-type of astrology, ever since the days of Alan Leo, they do also have the assurance that astrologers in India have the experience of using harmonic divisional charts on a daily basis.